Developing one’s individual heart and what things motivate it could quite possibly be the greatest challenges humans face in any stage of their lives. For most, this issue pops up in our teenage years, when just about everything can present a crippling hurdle for the unconditioned self. Some might simply continue on fine, some might lash out, and then there are people who will cling on to what they felt was normal despite changing feelings. Truly, the heart is something that will always take shape no matter what happens, and it can be magical at times to witness. Here begins the fever that is Uchuu Patrol Luluco. 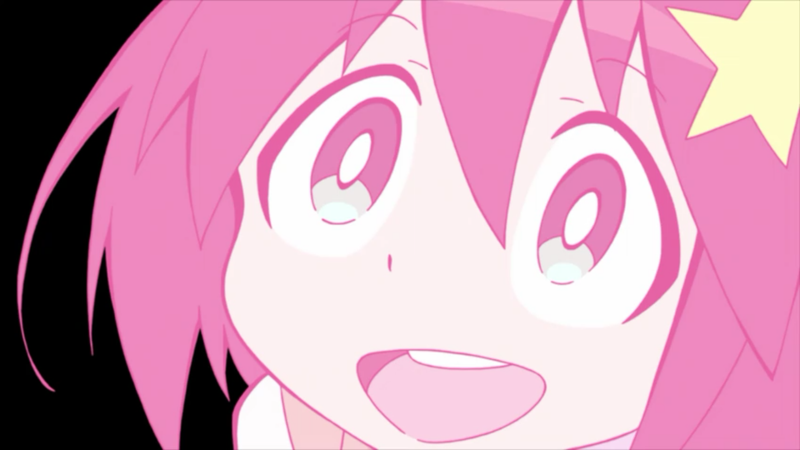 There is much to be found in Luluco that has been analyzed thoroughly since it debuted last season (seriously, you can dig up just about every detail with just a quick search), but the one thing I find irresistible is just how clear the message of finding solace in one’s unique feelings can spark the life’s adventure is. What’s more is that this message is proudly lifted by a charming tale full of over-the-top delivery and doubles as a love letter to fans of the animation studio, Trigger. As the titular heroine states for most of the first act of the series, Luluco is a young girl whom has played her cards carefully to maintain an extremely tame and typical life (which is ironic given the fact she goes to school with aliens and her father works for the Space Patrol). Of course, as all things go, she is thrown from her reality in a bizarre turn of events that leave her abandoning her facade. For the first time in her life, Luluco experiences the unknown- marvelous space travel, perilous combat with space pirates (some named Mom- but hey that’s neither here nor there, eh? ), and falling in love. For such a strange new world, first love being the driving force behind what someone does feels like a rather organic reason. There’s no quest for revenge to propel the protagonist here- just the youthful mind jumping to conclusions and dreaming of forever off of those misconceived moments. Without getting too far into the series, it feels so right to carry the main character from death to life anew off of the establishment of resolve in the heart. The theme doesn’t necessarily scream at you, but it serves its purpose in the middle of the comedic pacing and charming visuals. As I processed the extravagant awareness the series had to its roots and the marvels that got it there, it felt nothing short of beautifully poetic that our heroine stamps her place in the decorated history of Trigger exactly how she didn’t want to live- atypical. Clocking in at just a bit over an hour and a half, this short series puts itself into the race as one of the most essential binge worthy series of 2016. Don’t let the short time deter you though- this gem just might shine a little brighter than anything else in the pile this year if not just for its unique properties. What did you think of this title? Do you have a short series you found charming? Let me know, and have a wonderful day!